Founded in 1997, November Coaltion's membership represents citizens from all walks of life who find themselves questioning the motivation and ever increasing militarization and imprisonment behind the United States war on drugs. 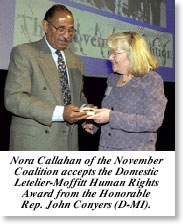 In October 2000 the November Coalition was given the domestic Letelier-Moffitt Human Rights Award in honor of Ronni Karpen Moffitt, an Institute for Policy colleague slain by Chilean secret agents on DC's Embassy Row in 1976. Scroll through the titles and images above to read more about November's mission, history and work. The drug war does not reduce drug use. Choosing to wage a 'war' on drugs stimulates a violent, underground economy, an economy which would collapse if drug prohibition ended. Our country, our world should be safer, not simply less free. A small group of prisoners and two prisoners' sisters took the first steps to create a ‘bottoms up’ organization to teach and learn from others about the human destruction and mass incarceration caused by the US war on drugs. Relying on personal stories and family histories, the Coalition began illustrating how drug prohibition laws produce crime, corrupt the criminal justice system, increase illegal drug use, and leave a trail of broken family relationships due to separation by incarceration. Out of a Colville kitchen in northeastern Washington State grew a national organization. 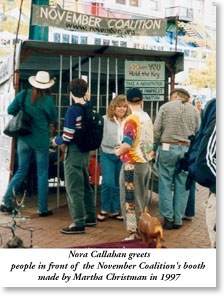 Nora Callahan was a principle November Coalition founder in 1997, recruited and urged on by her long-imprisoned brother, Gary Callahan. Encouraged by other prisoners at Oxford Federal Correctional Facility in rural Wisconsin, Nora and Gary were first helped on the outside by Martha Christman, a local artist living near Nora's home in Colville, Washington. Martha's son, Ian, designed the initial website graphics and organization's logo from his home in Georgia. On April 1, 1997 Nora uploaded the November Coalition's website. Within days, correspondence and communications between prisoners and their loved ones developed into thousands of conversations with many others through the 'magic' of the Internet. 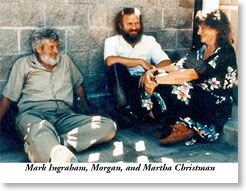 Martha's brother, Mark Ingraham, was serving 10 years for a marijuana conspiracy. Morgan, a friend of Mark, Martha and Ian, set his hands to a computer keyboard for the first time in his life, entering thousands of names of new November Coalition members the first months. Martha built an information booth for public events, Consuela, another Colville woman with a loved one in prison, managed the booth while Nora gave public speeches and kept her paying job. Within a fast growing network of volunteers on both sides of prisons' walls and wire, they "gave it all to the cause." The enthusiastic response gave new impetus for communicating with a mass audience. The first issue of the Coalition's Razor Wire newspaper was published in May 1997, with defined goals of reporting on drug policy reform efforts, legislative updates, news about drug law vigils and meetings, legal analysis, and shared letters between prisoners and citizens of the free world. Founders agreed that drug war prisoners had to be ‘humanized’ after a solid decade of ‘drug scare’ propaganda and demonization dominating national media stories. Publishing drug war prisoners' stories, their ideas for real solutions were featured at The Wall and in the Razor Wire. The Colville home office began designing projects within their membership and network of other organizations that taught people how to lobby government officials by first educating friends, family, associates and their communities. Like ripples on water, the Coalition's condemnation of the drug war soon rolled into thousands of relationships through a diverse network of volunteers and sympathetic media. Throughout 1997 and 1998, online communications networked a home office in Colville, Washington with emerging drug reform leaders, prisoners' families, major media writers, and college students needing drug war facts for term papers and dissertations. People in diverse places rolled up their sleeves and began to resist the drug war where they lived. The Coalition's Voice of the Prisoner CD, a project initiated and managed by John Humphrey, a musician and activist in Los Angeles, was produced in autumn of 1998. Outreach promotion by volunteers pushed the collection of prisoner narratives of their experiences to one of the top 20 requests in the diverse rap music culture, ranking as high as #14 on some micro-broadcaster's hip-hop charts! 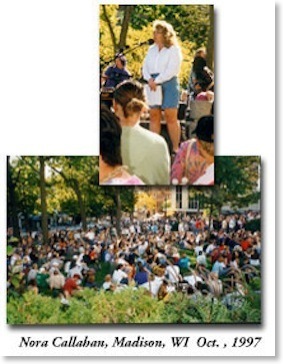 With public interest established, November Coalition launched its National Vigil Project in early 1999. 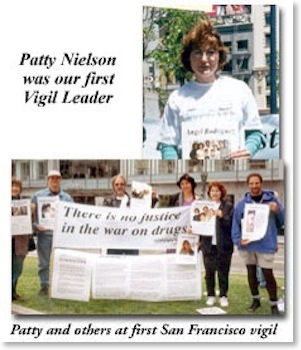 The Project was an expression of the Coalition's determination to promote regular, visible and nonviolent actions declaring opposition to the injustice of the drug war. Drug War Vigils became a national expression of public discontent in a failed war on drugs. Attention to prisoners of the drug war accelerated when corporate media journalists investigated stories they'd found on The WALL. 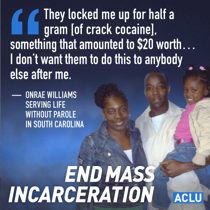 The injustice of the war on drugs, and a carceral crisis began to get the media attention it deserved. The acclaimed PBS documentary, "SNITCH," which aired first in the spring of 1999, was produced in consultation with staff and members of the November Coalition, other reform groups, prosecutors, judges and lawmakers. By year's end, and on the eve of a new century, there were a dozen regular vigils ongoing outside of jails and courtrooms. In cities and towns across the US. people held the Coalition's banner–– There is no justice in the war on drugs. On February 15, 2000 the National Drug War Vigil Project coordinated simultaneous vigils marking and denouncing the infamous day when the US prison population reached the milestone of two million incarcerated. There were 43 Two Million Too Many vigils that mixed hundreds of reform activists with prisoner's family members in a show of popular unity. Press coverage included national and international reports. A media blitz in the mainstream followed the arousal in public interest. The presidential election in November 2000 gave opportunity to do widespread petitioning, inside and outside prisons. Eric Sterling asked November Coalition to organize a Jubilee Justice campaign that would ask President Bill Clinton to pardon and release all nonviolent drug offenders who had served 5 years of their federal prison sentence. Local volunteers developed savvy public experience and, through vigils and other public appearances, secured signatures from passersby who agreed with the Jubilee request and spirit of forgiveness it embodied. In many institutions, prisoners were able to collect signatures and assist their loved ones' outside activity without violating prison rules governing every kind of organizing. Jubilee Justice 2000 was well underway when the summer 2000 Shadow Conventions were held. The idea for a Shadow Convention originated from national drug reform leaders, especially Ethan Nadelmann, and prominent entertainment figures: Arianna Huffington, Susan Sarandon and Tim Robbins. Together they knew that neither Democratic (meeting in Los Angeles) nor Republican (meeting in Philadelphia) Parties would include any progressive drug reform planks in their respective campaign platforms for 2000. 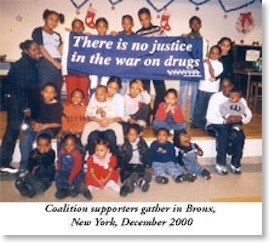 November Coalition brought its mission and message to Philadelphia's Shadow Convention of August 2000, teaming up with Mary Gaines of Federal Forum in St. Paul, MN, and other volunteers from New York City, Detroit, MI and Cleveland Ohio, about 24 ‘orphaned’ children of the drug war, travelled by bus to Philadelphia. African-American children from toddlers to teens shared stories in song and poetry before a large, live audience and attending national and international press. With power and eloquence they expressed what it means for poor, black children to be without a mother, or a close family member, who is in prison for a drug law violation. The Jubilee Justice 2000 signatures were collected until Clinton left office. 41,000 names were presented to Rep. John Conyers (D-MI) after Coalition organizers attended the IPS awards event in October 2000. As the last petitions were mailed from Washington State to judiciary leadership in Washington DC. Organizers looked with positive expectation to the larger map of alliances created across the U.S. around drug war and imprisonment issues. More than 800 citizens from around the world, 1,200 families, 2,000 prisoners became involved, and the mainstream media. There was no mass release, but Clinton pardoned about 36 people, most of them prisoners of the drug war, many of them members of the November Coalition — all of them having filed request for Presidential Clemency. In 2001 the Coalition launched Open the Can, a CANpaign for Freedom. Based on the idea that prisoners are packed into our nation's prisons like sardines, the project involved special labels applied to sardine cans, and sent to elected officials in Washington, DC. Artwork was provided by prisoner Henry Potwin. The aptly-labeled sardine cans were becoming a visible protest of drug war imprisonment until the Post-911 anthrax contamination chilled reception in the halls of Congress. They could no longer be sent to our federal representatives. le Patsy Mink passed away due to complications from chicken pox, the parole bill dying with her. November's Journey for Justice came from the extreme need and aspirations of thousands of drug war prisoners and their loved ones victimized by unjust drug and sentencing laws. We journey to fortify resolve and awaken the dignity of ordinary people assaulted daily by a drug war that isn't a war on drugs - but a war on people. With Petitions for Relief from Drug War Injustice in hand, Chuck and Nora also gathered signed petitions from volunteers as they traveled. Event coordinators invited their communities to “meet the people behind the statistics that rank the United States of America world's leading jailer." With local organizers hosting potlucks, college presentations, vigils, church pulpit and Sunday school presentations, November Coalition brought together their members and interested citizens for open discussion of critical drug war issues including imprisonment. Once home, staff and volunteers re-authored the 2001 "Guide to Grassroots Activism," renaming it Bottoms Up, A Guide to Grassroots Organizing. It's always been available online at no cost. The Coalition’s national office operated from a small home in a residential neighborhood of a small town for seven years. In summer of 2004, we moved to property that includes several offices, volunteer work areas, meeting and guest rooms, commercial kitchen, landscaped grounds and cottage. By the end of 2004, November members had collected nearly 100,000 signatures of support for earned early release or return to federal parole. Several bills in the House of Representatives and Senate demonstrated that Congressional interest for an early release plan was growing. 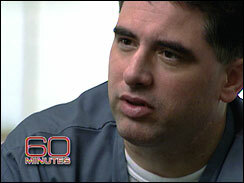 But Richard Paey, a pain patient in Florida was sentenced to 25 years in prison. Siobhan Reynolds of The Pain Relief Network and the Paey family championed the difficult issues that people confront who must have opiates to live. November came in later when we began to feature Toons by Paey, a series of very funny cartoons about his terrible plight. 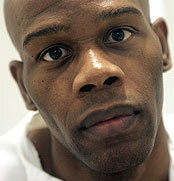 After his conviction, media coverage proliferated, and the injustice unveiled. These efforts from grassroots organizing to major media combined and culminated in a full pardon by Governor Crist in 2007. During Richard’s struggles, November staff verified that Texas prisoner, Tyrone Brown, had served 14 years of a life sentence for testing positive for pot. Dallas Morning News reporter Brooks Egerton found the story at The Wall — , investigated, expounded, and citizen pressure on authorities to release Tyrone from prison mounted. You can check out the media coverage, the story and poetry November first featured online. All of these efforts ended only when Tyrone Brown was released by the Board of Pardons in late 2006. By 2008 our members began seeing key developments in federal sentencing -- from courts, Congress and various commissions. Enough people encouraged and influenced leaders to support legislative reforms, including the Second Chance Act and federal crack cocaine sentencing amendments, also urging the United States Sentencing Commission to make crack cocaine sentencing reductions retroactive, which was granted. The US economy stumbled into financial collapses late in the century’s first decade, some states began eyeing the overuse of imprisonment as a budget bloating enterprise. We saw Congress approve new legislation almost equalizing crack and powder cocaine sentencing, but neither the US Sentencing Commission nor Congress has yet to yield to public pressure to make the new law retroactive for prisoners now in custody. The Second Chance Act is still under-used and lightly-funded, the Obama Administration’s 2012 budget has increased spending for maintaining prisoners and people in them and wants to build more federal prisons. At the very least, the sick, aged prisoners, US war veterans deserving sentencing reductions, the people the "Fairness in Sentencing Act of 2010" didn't address. If so, the plans to expand the federal prison system could be abandoned while the excess prison budget was cut, not increased. Friends, please read Bottoms Up: Guide to Grassroots Activism, authored by the staff and volunteers of November Coalition in 2001 is always being expanded and updated for for all of us. It’s free and online, and where you can learn from drug reform advocates to begin forming a local group to carry out public events that work to end drug war injustice. You might not be able to be at November’s facility, painting, or pounding nails, reading and organizing mountains of prisoner mail — but you can work with us from where you live. The November Coalition steadfastly relies on public support. Your membership, donations or gifts are appreciated and tax deductible. Robert C. Randall pioneered the medical marijuana issue in America. A model citizen activist who took on the federal government, assisted in the defense of people accused of criminal offenses involving marijuana and worked to change the entire federal prohibition against marijuna's medical use. Citizen action is at the heart of a successful democracy. The Robert C. Randall Award honors those citizens who make democracy work in the difficult area of drug law and policy reform. Nora Callahan, Randy Credico, Chris Conrad, Mikki Norris and Virgina Resner, grassroots activists focusing on the prisoners of the drug war, received this award at the annual Lindesmith-Drug Policy Foundation Conference in New Mexico. Robert C. Randall died the night of the awards ceremony.